A friend recently gave me a copy of a delightful little book called Bread & Wine by Shauna Niequist. Not only are the short stories in each chapter inspiring and amusing to read, the recipes that are paired with each little story are amazing! I’ve tried at least 4 of them and they have all turned out wonderfully! I highly recommend the book. 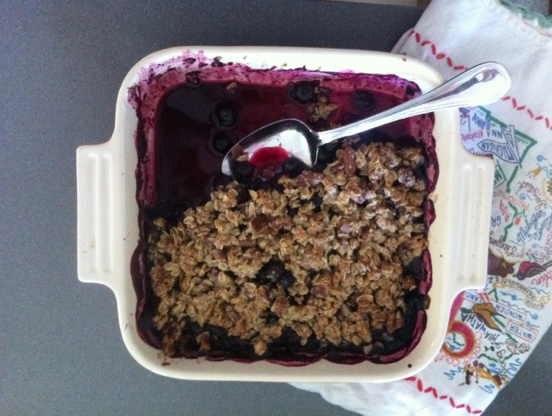 In one of the first chapters Shauna shares a recipe for Blueberry Crisp. A recipe her mother taught her and that she now serves every weekend in her home with her own family. It’s incredibly simple, very healthy (which I love! ), and the flavor is amazing. It’s the perfect recipe for this fall season. We actually made it with some apples we recently picked at a friend’s orchard, instead of the blueberries. I think it would turn out great with any fruit. Pair with ice cream and tada! Shauna Niequist is one of my all time favorites! I read Bread and Wine around this time last year and flew through it. Such a gem. And that tea towel! Love it! I’ve started collecting them for each city and/or state that we’ve lived in.